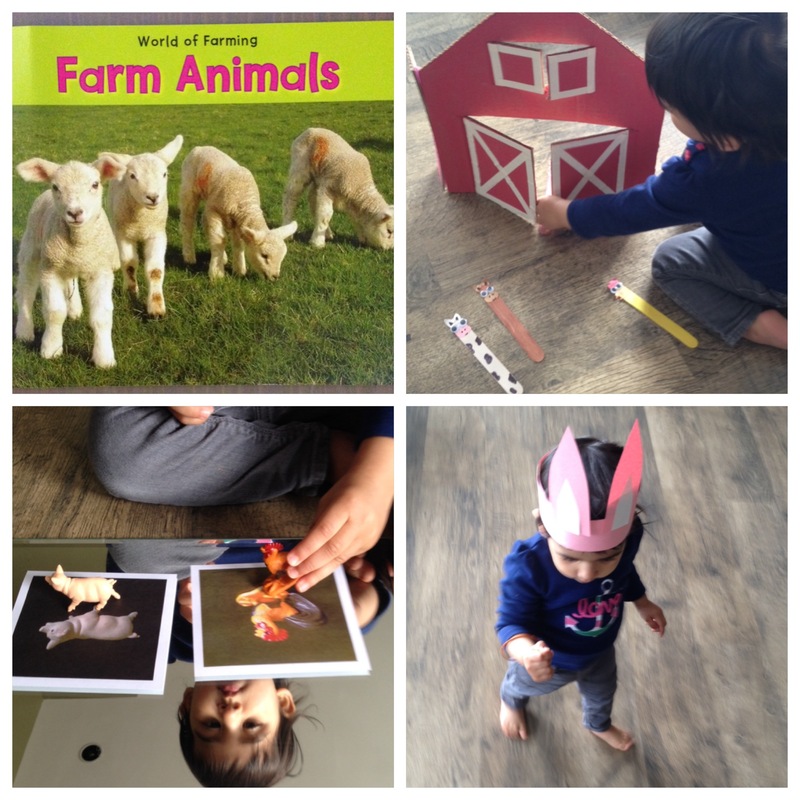 Farm Animals by Nancy Dickman – “Farm Animals” was a great read especially since we could review all the animals we had visited from our farm visit. We looked through and named the animals in the book repeatedly. 1. Matching Animals – This activity is inspired by a Montessori activity I had seen on Pinterest. I snapped photos of 8 of the plastic farm animals we have been using this week. I then gave R two animals and two picture cards at a time for matching. I defined the play space using a mirror so she knew to work in this area. She did well with two animals at a time but found it difficult when I tried four animals at a time. a. Make this activity more difficult by increasing the number of animals on the board for matching. b. Ask the child to match a specific animal and see if s/he can locate and match the animal correctly. 2. Barn Puppet Theatre – I made a barn out of cardboard and painted animals onto popsicle sticks for an invitation to play. My intention with this was to have R play imaginatively. She did just that, but not in the way I had expected. She hid the animals in the barn by popping them through the barn door or windows and then would lift the barn up and say, “pee-pee” (peek-a-boo). She did not want to stop this activity!! a. Construct the barn with your child or have them make it alone. Add more sections and build a complete farm. b. Have your child make their own farm animals on popsicle sticks. 3. Bunny Ears – Finally, I had wanted R to help me make an Easter hat by learning to use a glue stick. She was too tired from all the day’s activities that I didn’t push her to do it. Instead I made the hat for her and let her do with it as she pleased.